← Free screenings of latest Coffin Joe flick! This ambitious sci-fi thriller had the earmarks of a surefire hit. It’s an alien invasion epic with lots of scary monsters, explosions and battles, spiced with a few fresh ideas and served via excellent special effects work. It’s the brainchild of Chicago-born brothers Colin and Greg Strause, who designed f/x for 300, Avatar, 2012, and lots of other big effects pictures. So, why did it disappear so quickly from theaters after opening last November? Part of the answer is that, though it’s the story of a global conflict between space invaders and the human race, it’s modeled more on Night of the Living Dead than War of the Worlds. After our group of main characters is introduced and the space monsters land, for the most part they just hide inside a penthouse apartment, occasionally watching the alien/military conflict outside their windows. Whenever somebody tries to escape they are soon picked off in gruesome monster attack scenes. There’s nothing wrong with this – unless you’re watching the movie expecting the space monster thrill ride promised in the ads. Not unlike Cloverfield (and sections of H.G. Wells’s seminal alien invasion novel), the focus is on a few people scrambling to survive in the middle of an epic disaster, and this can be a valid and gripping way to portray such ‘larger-than-life’ events. But Skyline never makes us care that much about its leads and the most interesting characters are in supporting spots and doomed anyway. Another problem is the film’s villains and their confusing M.O. They come to a planet and attack using a variety of bio-mechanical monsters equipped with a strange blue ray (making this an excellent Blu-ray Disc demo choice) that first hypnotizes their victims, then somehow mutates their cells to make them more… um, ‘palatable’ may be the right word here. One character survives several exposures to the ray, which leaves him with some of the aliens’ attributes (stronger, tougher, and able to resist and maybe even control the alien influence). But we never really get a clear explanation of how and why this happens. Which brings us to the film’s ultimate problem. Spoiler here. The film doesn’t really come to a satisfying conclusion, just an abrupt set-up for a sequel, and a dour and sloppy one at that. 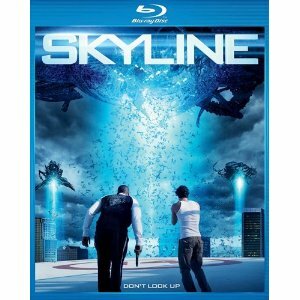 Skyline is good for some turn-off-the-brain eye candy, but has too many annoying traits to meet your space invader movie needs. This entry was posted in Blu-ray, DVD, Movie, Review and tagged blood, Blu-ray Disc, DVD, explosions, horror, invasion, Los Angeles, monster, Movie, Review, sci-fi, siege, space alien, spaceship, Strause Brothers. Bookmark the permalink. Had potential but half-way lost story focus. They should stick to creating sfx for other films with better story potential. That or go back to school and learn storywriting properly. Wonder if these two went to Tribeca to learn sfx? I disagree. I have never seen a movie like this. War of the Worlds wasn’t like this. Night of the living dead wasn’t like this. Independence Day wasn’t like this – and most importantly Battle of LA, with its terrible plot, ridiculous camerawork, and lame aliens wasn’t like this either. I really liked the Hispanic guy, and thought he did a great job. People love to bash this movie, but I like it. The only problem I had was after the heroine rips out the brain of the thing that attacks her boyfriend, it jumps up and attacks her again. That wasn’t logical, but I found the rest refreshing, even romantic, in a Swamp Thing sort of way.